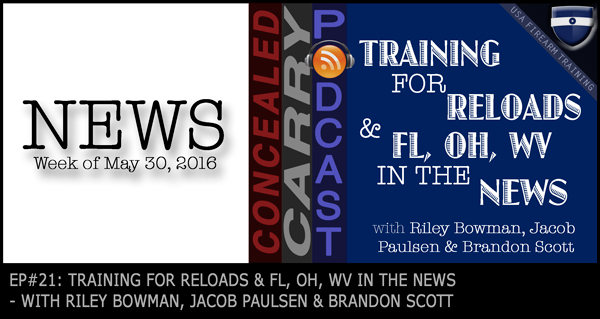 Later this week on the Concealed Carry Podcast we will be talking about “So I've Got My Permit, Now What?” Everything you wanted to know about the next steps to take after getting your CCW permit! Liked the episode guys! Talking about combat and tactical reloads! Really important. Also as you guys were talking about the editing of the ‘Under The Gun’ documentary I was thinking about the video a while back of Eric Holder saying “we need to brainwash people about guns”. This type of doctoring of facts is why we have people with such irrational fear of guns and anyone who owns a gun. There are 3 types of reloads (semiautomatic handgun) that I train my advanced students. This is reloading your firearm during an actually fire fight. For example you are involved in a shooting and your suspect (threat) is no longer an immediate threat. More than likely you will not know how many rounds you have discharged. This would be a good time for you to top off your firearm with a fresh magazine. So you should release your magazine (let it hit the ground) and than place a full magazine into the firearm. This is when you are in a firefight and you have completely discharged all available rounds in the firearm and the slide has locked to the rear hence why it’s called an emergency reload because your weapon is out of battery and your temporally out of the fight. This would more than likely be used while on the range. This is when you change a magazine that still has ammunition in it. With this magazine exchange you do not allow the magazine to hit the floor. This is normally done on the range during training. When doing a magazine exchange (unless you are behind cover) you should always keep your eyes on the threat (target or suspect) while doing a magazine exchange. An advanced pistol marksman can do a magazine exchange without looking at the magwel of the handgun or the magazine. Most competitive shooters (USPSA) can exchange magazines on the move without looking at the firearm. This is an advanced skill and it will take some time to learn how to do this. A tip of the day: You should always carry additional magazines if your carrying a concealed firearm. Not only to have more ammunition but also for any malfunctions you could have during a deadly force incident.